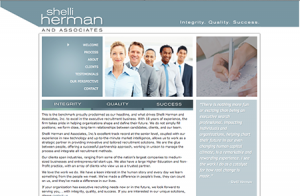 For Shelli Herman & Associates, we took an existing HTML web site and transformed it into a WordPress site identical in design to the original site, so that the Shelli Herman & Associates team could update and manage their web site on a day-to-day basis. “My firm recently needed the assistance of expert web site conversion team. We retained the Business in Blue Jeans experts and were very impressed with their patience, high attention to detail, strong customer service focus, and expertise when it comes to the business of technology. In this case, we could not have been more pleased with the speed at which our project was executed.